View the volunteer workday schedule HERE. View the volunteer workday schedule here. Please join us! Conservation landscaping means working with nature to enhance wildlife habitat, reduce pollution and conserve water. It's important because how we manage our landscapes – from backyards to neighborhoods and beyond – shapes the shapes the health and ecological value of our communities. 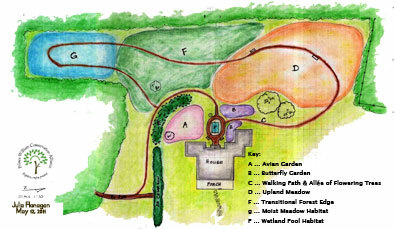 Merrimac Farm Conservation Landscape Plan! The conservation landscape at Merrimac Farm uses all native plants to create new habitats for wildlife. We are expanding natural areas to reduce grass, enhancing vertical structure and increasing the variety of food sources to welcome a wider variety of wildlife. Click here to read more about the plan. The Merrimac Farm Conservation Landscape is transforming the backyard of the Stone House Visitor Center into a diverse habitat for birds, butterflies, moths, turtles, amphibians and more. Here creatures great and small can find nesting sites, food, and places to rest and hide among a wealth of Virginia's native plants. This four-season greenscape of native plants creates a high quality natural area for families to watch wildlife in a public area that is easy to access… and demonstrates how any suburban or rural yard can be transformed from sterile to fruitful land, where adults and children alike can delight in nature. "The Merrimac Farm Conservation Landscape project will provide a fantastic model for all Virginians to emulate. Incorporating native plants into our personal landscapes is the single best way each of us can help enhance and restore the habitat so critically needed by wildlife, while increasing our own enjoyment and pleasure in all things wild and beautiful."